BJSC Exam Result2019 will be publish soon. 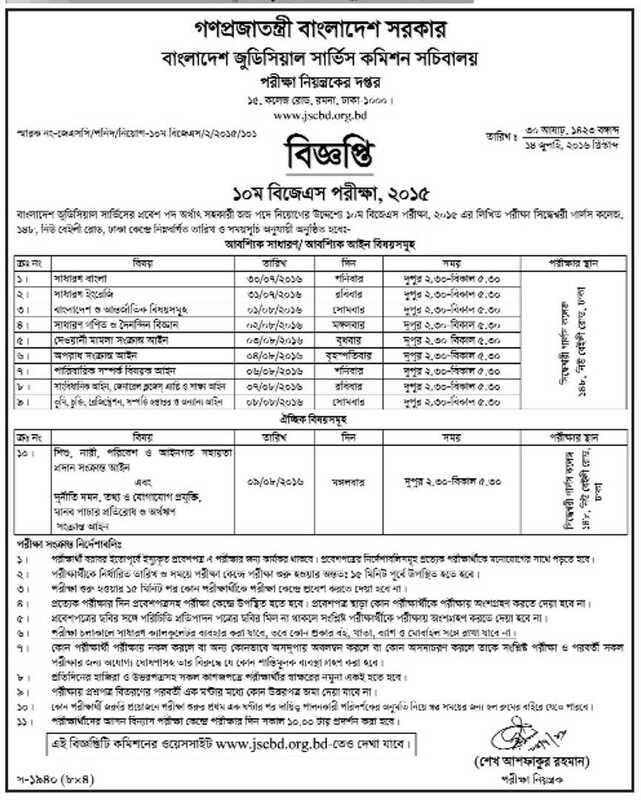 Bangladesh Judicial Service Commission (BJSC) has been announce 12th Judicial Service exam date and time. You can Download or see the routine from our site. You can also found here exam center and seat plan. Bangladesh Judicial Service 12th BJSC Exam Routine Result. 12th BJSC Exam circular has been published. You can also apply from our site. We are also included other information in our site. So, you can also see all other information in our site. Now you can only see exam circular that are given below. The exam will be end 9th August 2019. All exam will be start at 2:30 PM and will be end 5:30 PM. Exam center name is Seddhesory Girls College, 148, New Baily Road, Dhaka. See 10th Bangladesh Judicial Service BJSC Exam Routine 2019. 12th BJSC preliminary exam was held on 20th May 2019. Now the authority has been announce written exam date and time. You can see exam date and time from our site. We are also upload written exam result in time. At first written exam will be held. After that the authority has been publish written exam result. You can also found the result our website. Visit our page regularly form getting latest update news. 12th BJSC written exam routine already published in our website. You can collect it by download. You must be prepared for this exam. Exam will be held at 2:30 to 5:30 PM. You must be attend about 15 minute before. You can see written exam result in our site. You can also download your result from our site. We are published written exam result as soon as possible. So you can found here all kinds of information in time. We are also published viva exam date and result. If you are face any problem to getting your information then inform us. We are try to solve your problem. You can also found here other relative information. Because we are try to give you best service.